Drug-sniffing dogs: The Supreme Court will hear argument on whether they are unreliable enough to be considered an illegal search and seizure. 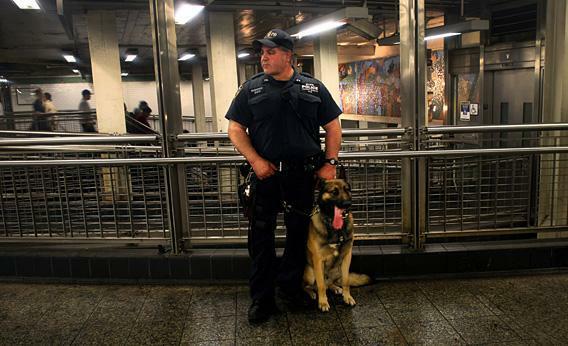 A police officer and his dog, Buster, watch pedestrians in New York City. Photo by Yana Paskova/Getty Images. I suppose it’s no surprise that those of you who answered my call for stories about police detection dogs mostly reported searches gone awry. Obviously, in many instances dogs find the drugs or bombs they are dispatched to sniff out. If I’d sent a query to prosecutors or police officers, I’m sure I’d have received plenty of success stories. But that’s not what you, dear readers, wanted to talk about. And in your tales of false alarms or, ahem, the contraband that got away, you’ve made me wonder all the more whether dogs are reliable enough to warrant all the deference the law gives them. A member of the town council in a small village in Ohio told another tale of woe. His council hired a dog handler and dog team and paid more than $7,000 for additional training, only to be told that the dog could only do search and rescue, because the handler had mistreated the dog rather than training him properly. Now the town has a new dog and a new handler. However, the councilmember reports, that a dog handler “can’t go hopping town to town as an officer with his dog-for-hire.” Every town has to carry liability insurance and re-certify the team. The Ohio town has balked at paying for more training, so the authority of his town’s dog and handler to make arrests is up for grabs. (That’s actually an issue in one of the Supreme Court cases, because one of the dogs had a lapsed certification.) “Each time I see our K9 patrolling I can’t help but smile ironically at the notion that people seemingly believe the scary dog will bust them or will give off a signal,” the councilmember writes. “It does certainly work as a deterrent and I doubt I could argue against this point; it only ceases to be when folks realize (and it is public record) the K9 unit has as much authority as I do in a court of law.” The problem of proper certification and standards doesn’t seem hard to fix. But apparently that hasn’t much happened yet. I was also not encouraged by this story of a broad-based search. “I am a junior high school teacher,” Tony writes. “At least once or twice a year we have random drug sweeps done by dogs. The most memorable was when a dog went nuts, barking and scratching a locker right outside my classroom. It was quite dramatic—all the barking and scratching and words of encouragement from the handlers. Unfortunately for the police, when the locker was opened the object of the dog’s alarm turned out to be a half-eaten piece of cake at the bottom of the locker.” Tony doesn’t say whether the dogs sometimes find real drugs. I also heard about random searches in high school parking lots and cars parked at the county courthouse in a small coastal community in North Carolina. “Police abuse it all the time—those drug dogs are used at the drop of a hat, especially with young people and in routine vehicle stops. And naturally, police and prosecutors act as if they’re infallible,” my North Carolina emailer wrote. So he decided to bring in the K-9 unit. I sat in the police cruiser for over a half hour waiting for the dog to arrive, all the while being harassed by the trooper as if I were a criminal. When the K-9 unit finally arrived the dog was led around my vehicle approximately 4-5 times. Jumping up on the hood and the trunk in the process. The dog signaled nothing to the officers! The officers then chastised me for not just letting them search my car. I was given no speeding ticket, just a written warning, and when I requested to see a read-out of the speed I was going I was denied. After being detained for over an hour I was free to go. No apology or even a kind tone. Pretty fun experience let me tell you. Then there were the people who escaped from dogs who should have caught them but didn’t. One reader who shall remain anonymous was approached by a police officer with a dog on a leash on the train from Milan to Munich. “As the dog got closer I remembered to my horror that I also had a half smoked roach in my wallet, which was in my hip pocket,” he wrote. “At that point there was nothing I could do: If I took the wallet out and held it high in the air that would look suspicious, and would likely waft some scent in the air. So the only thing I could do was to pretend that I was phobic of dogs (which was true, for this one) and stand up on my tiptoes as he went by.” The dog passed on by, then went straight to the backpack of a woman who turned out to be carrying cookies inside it. David had a similar close call at the Rome airport, on his way to Florence. He got off the plane with four sticks of hash in his pocket, only to see an Italian guard and a German shepherd approaching. David made it through a round of questioning, walked away, and started eating the hash. Then he saw another dog at the baggage claim. “I was feeling more confident this time though, and walked up to pet it, since the hash was by this time dissolving in my stomach.” Another officer questioned him but let him go. “I felt great by the time I got to Florence,” he reports. He adds that he thinks dogs are “an excellent deterrent” and that he hasn’t brought drugs to the airport since then. Genius. In the interest of a bit of evenhandedness, I’ll end with the dog-loving testimony of Paul, a retired officer of the Bergen County police department in New Jersey. As a former shift commander, he reports, “I have always thought highly of the handlers and dogs I worked with. They were both professional and effective. (And I just plain like dogs. )” Me too. The question for the Supreme Court, though, is whether their noses are like no other tool of law enforcement—so reliable that a dog sniff doesn’t count as a search, for constitutional purposes. Your stories, I have to say, suggest otherwise.